Image of nanopillar-like poly-crystalline STF film obtained by transmission electron microscopy. Credit: COPYRIGHT (C) TOYOHASHI UNIVERSITY OF TECHNOLOGY. ALL RIGHTS RESERVED. It is essential to develop the constituent materials of the next generation of devices in order to develop these devices for information processing based on new phenomena such as magnonics, magnetooptics, multiferroics, and spintronics. Fabrication of nanostructures that cannot be obtained in nature is allowed by the currently growing progress in nanotechnology. However, complex magnetic oxides are considered to be one of the most complex material systems based on analysis and development. Additionally, the detailed mechanism is unknown by which modifications in atomic composition that do not influence overall structure lead to extreme changes in material characteristics despite the fact that the material structure is similar. 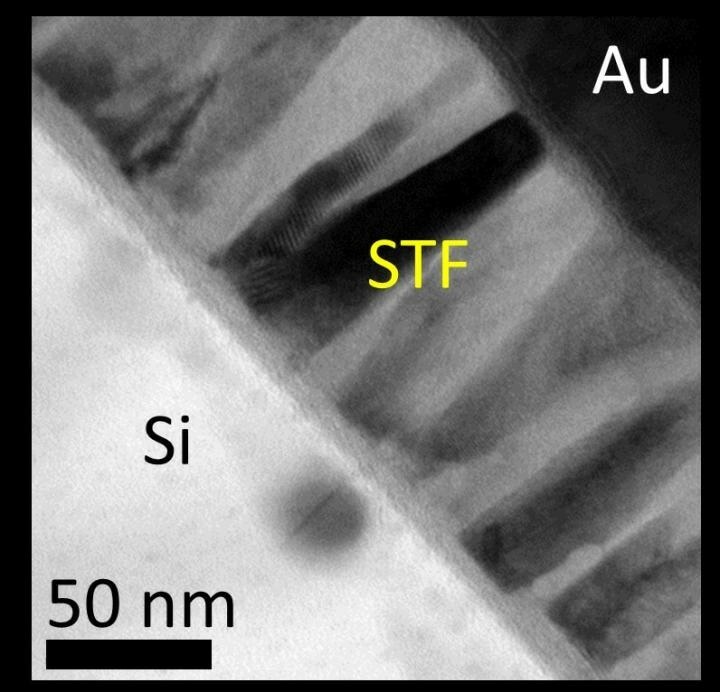 Researchers at Spin Electronics Group at Toyohashi Tech and at Myongji University, Harbin Institute of Technology, Massachusetts Institute of Technology, Universidad Técnica Federico Santa María, University of California, San Diego, and Trinity College Dublin recently discovered that nanoscale pillar-shaped distribution of iron in strontium titanate (STF) brought about drastic changes in its magnetooptical and magnetic response. When compared to a single crystalline film, the polycrystalline sample unexpectedly showed stronger magnetism. In usual oxide systems, magnetic and magnetooptical effects are stronger in highly ordered structures. In other words, single crystalline material is better for obtaining better magnetic properties. However, iron-substituted strontium titanate deposited at certain oxygen pressure is different. Preparation of the STF films was brought about by pulsed laser deposition at different pressures directly on silicon substrate, followed by the systematic characterization of magnetic properties and crystalline structure. Considerably stronger magnetism and bigger Faraday rotation angle (magnetooptical effects) at room temperature were showed by a sample deposited at a specific pressure. Several tests examining the oxygen stoichiometry and the corresponding Fe valence states, the existence of small-volume fractions of iron, and the structure and strain state established the fact that magnetism was improved by the clustering of the elements and the nanostructure. The broad possibility of using polycrystalline films in silicon-based devices is revealed by these results. The incorporation of STF film with 0.1 mm scale optical resonator has been demonstrated. Additionally, the possibility of developing interesting systems in the future is emphasized by the integration of such novel oxides with standard device concepts.